A frightened bear cub was left running for his life after his mother was supposedly killed by poachers. The animal was discovered near a local police station in a Siberian city, and has now found a home at the local mini-zoo. “[The cub] likes chocolate candies, berries, like a child,” Zhargal Ayushev, a specialist at the at the Ethnographic Museum of Transbaikalia’s mini-zoo in Ulan-Ude, told Komsomoskaya Pravda, with a smile on his face. The animal was spotted by locals from Murkhoshibir in the Republic of Buryatia at 6:30am on May 9 near a police station. 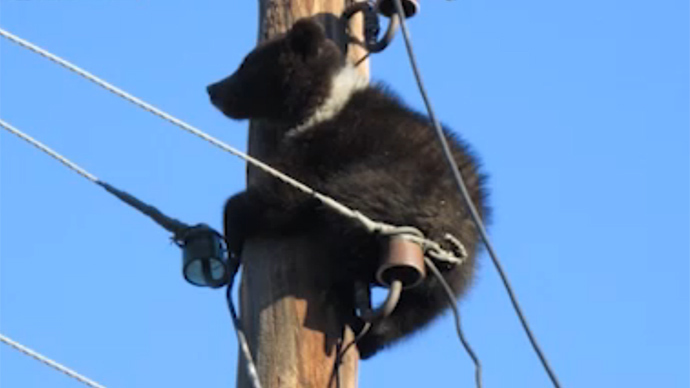 The cub became scared of the people and climbed up a utility pole, said an official from the Inspection for the Protection of Nature, Mikhail Klementyev. Police immediately called an electrician who safely returned the animal to the ground. Police launched a criminal case, suspecting that the two-month-old cub’s mother was killed by poachers. “The natural environment of our area is not actually suitable for bears. We suppose the bear cub came from the taiga,” Andrey Fefelov, state inspector for nature protection, told local Arig Us TV channel. Klementyev said that authorities had been having trouble finding a home for the cub – local circuses and zoos were not willing to take the little bear. After almost loosing hope, a vacant place was found at the Ethnographic Museum of Transbaikalia’s mini-zoo.